George Murley was educated at Kendrick School, and later at Ardingley College, Sussex. 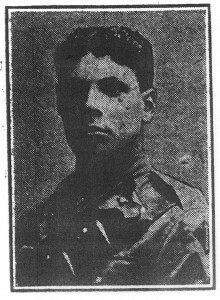 The good news that his wife, had delivered a daughter, Katie, was announced on February 16th 1917. The family lived at The Gables, Upper Redlands Rd. 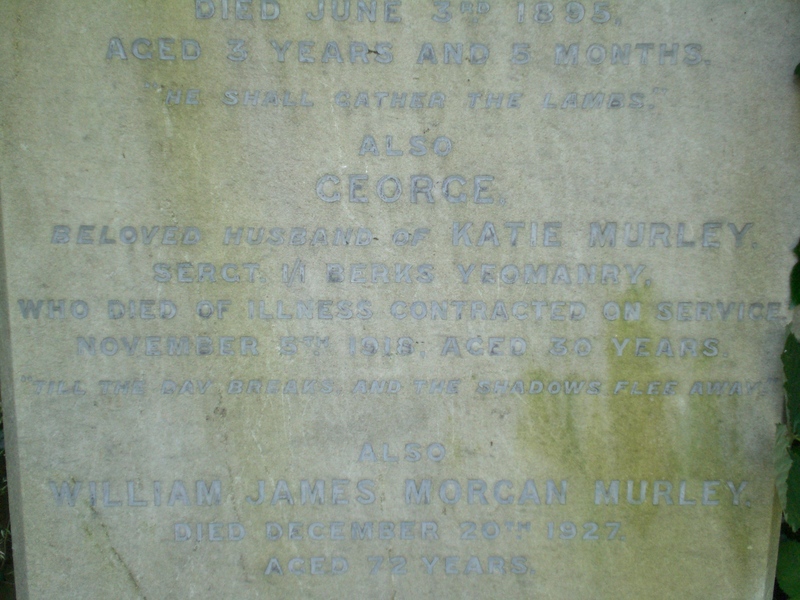 He was the youngest son of Mr and Mrs William James Murley of 87, London St., Reading. George joined the Yeomanry some time before the war, and on the outbreak of hostilities volunteered for foreign service. He was sent to Egypt, and was stationed for some time in Cairo, where he met with an accident, his horse throwing him and he broke his ankle which necessitated his return to England. 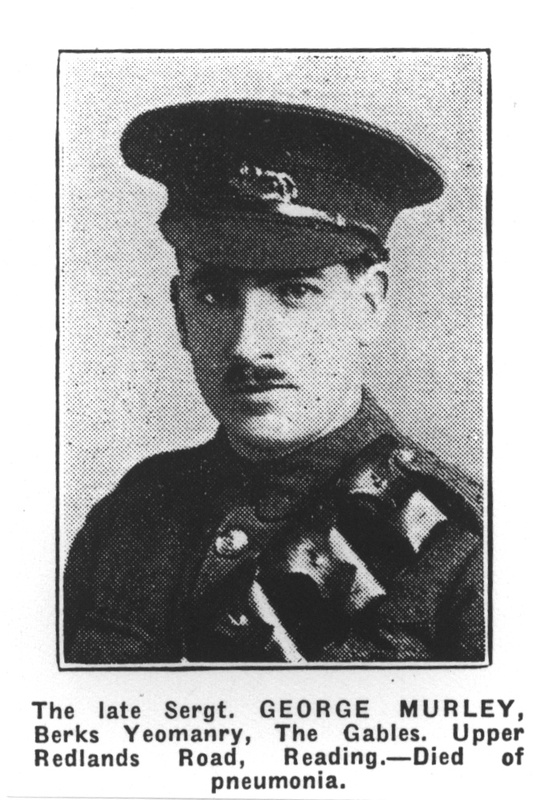 He was thus unable to go to Gallipoli with his regiment. 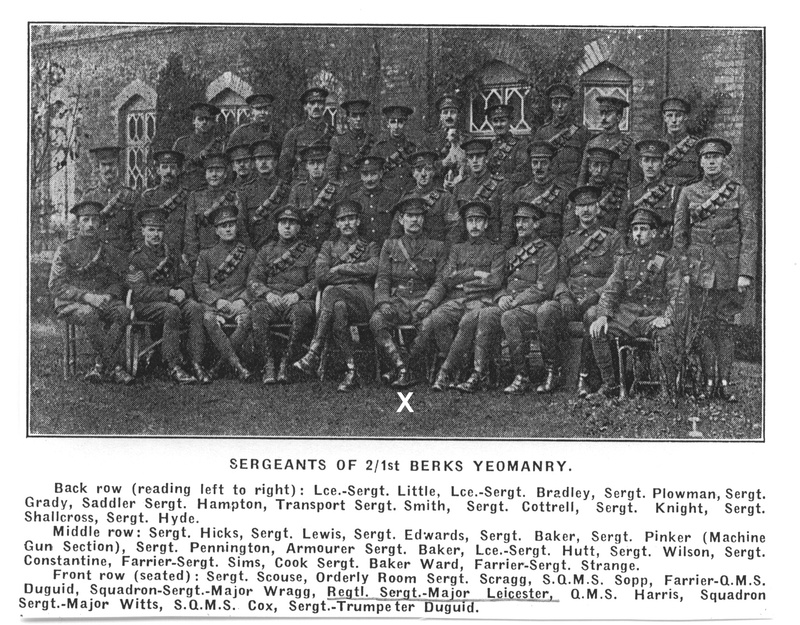 On regaining some fitness he was given clerical employment at Yeomanry House, and afterwards was transferred to Canterbury. 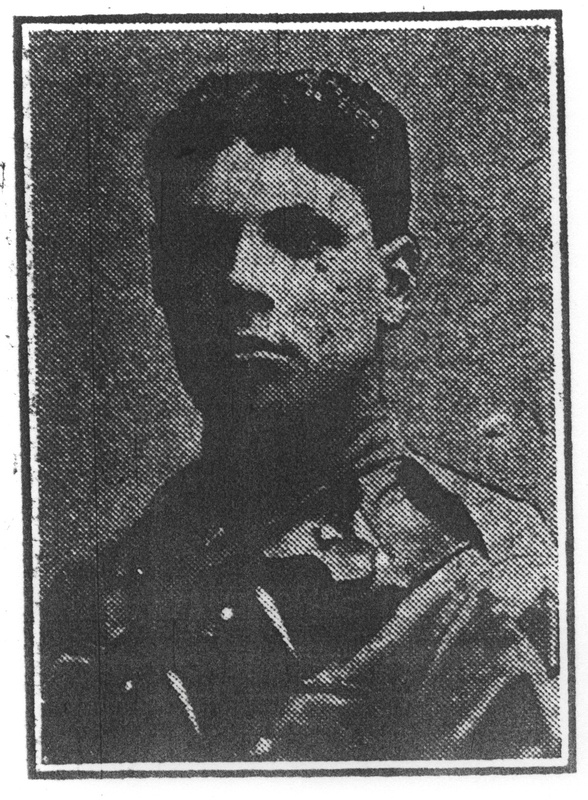 Ordered in October 1918 to take a draft of men to Ireland he got wet through and caught a severe chill, and on returning to Reading, where his young wife was living, he found he was too ill to proceed back to Canterbury. He was taken to Wilson Hospital on the Saturday, suffering form pneumonia, and died on the Tuesday. At the time his father was also lying seriously ill. He was given a military funeral. He was 30 and prior to the war worked in his fathers business. His papers were through for a commission and he would have been gazetted on the 26th November 1918, he died on 5th November 1918. His is aregistered war grave but with a headstone chosen by the family rather than the portland stone war pattern headstone. 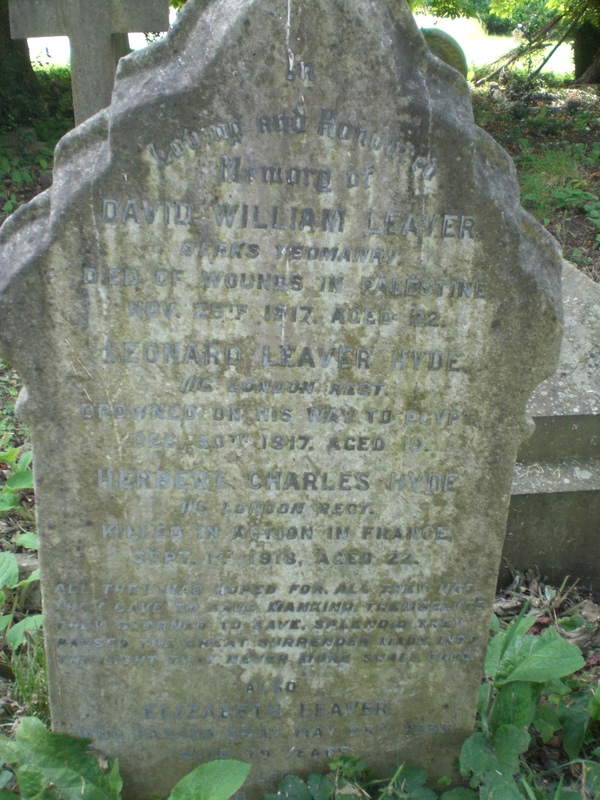 David William Leaver is commemorated on a large headstone along with Leonard Leaver Hyde and Herbert Charles Hyde. 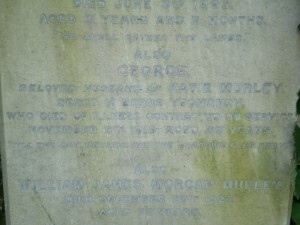 The family headstone has details inscribed on both sides of the stone and the three boys were obviously related. 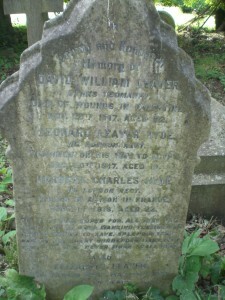 David Leaver was the only son of Alice and Alfred Leaver of 52, Cumberland Road, Reading. He was 22 when he died on 25th November 1917, of wounds received in Palestine. He is commemorated on the St. Bartholomew’s Church memorial. “A bright spring time, a few days of summer and then the end. He is buried in Ramleh Convent Garden Cemetery, Palestine. William Victor Ross Sutton, son of Readings Mayor at the time, was killed in action twelve days before him and is buried in the same cemetery. In loving memory of my dear pal (Dave), died of wounds at Ramleh, Palestine. For grief often dwell where it seldom is seen. Prince of Wales’ Own Civil Service Rifles. Herbert Hyde is buried in Rancourt Military Cemetery , Somme. Grave location A. 3. Rancourt was in an area of severe fighting during the allied offensives in the late summer of 1918. The village was taken by the British the day Herbert Hyde was killed. Leonard Leaver Hyde was on board HMS “Aragon“ going to join the BEF in Palestine when the ship was torpedoed in the Mediterranean on December 30th 1917. Leonard was aged 19. He was the brother of Herbert Charles Hyde and second son of Henry & Ellen Hyde. He had joined the army on Jan 29th 1917. He was educated at St. Stephen’s and Reading Blue Coat School, and was a clerk at the GWR Goods office Paddington. Herbert and Leonard are both commemorated on the Reading University College memorial. Thomas John Leicester was the husband of Fanny Elizabeth Leicester, of 36, Waylin Street, Reading. 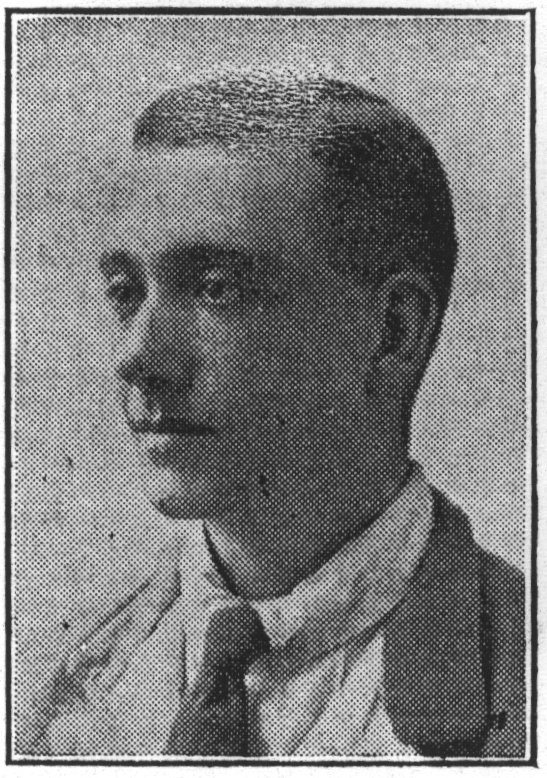 Thomas Leicester had served in the Boer War and had obtained a Long Service and Good Conduct Medal. 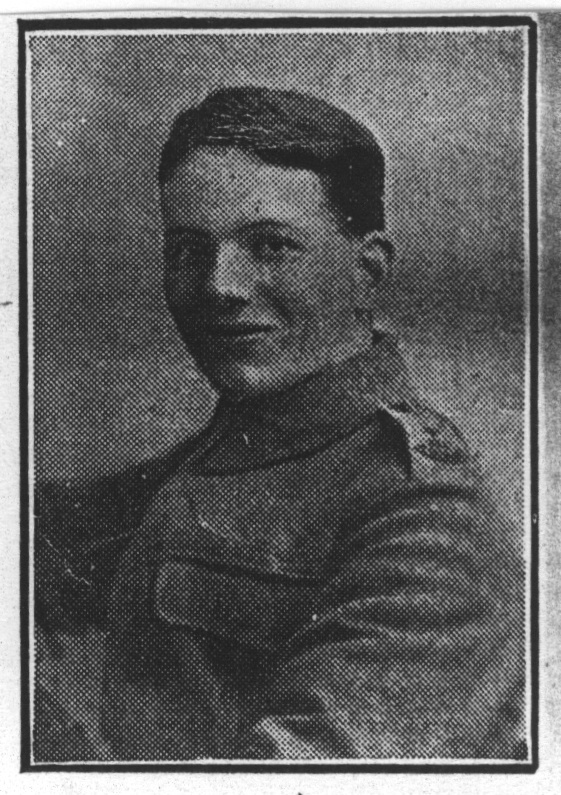 He died on 31st March 1918. Cause of death is not given, it is possible that it was influenza, there was a serious epidemic at the time.